The use of patient reported outcome measures (PROM’s) is being integrated into healthcare around the world, at a fantastic pace. PROM’s are key to understanding the quality of care delivered across multiple medical disciplines. There is a growth in the number of clinical registries emerging to help healthcare providers get clear insight into a range of procedures, using PROM’s to gather the information required. It is also being used to manage research outcomes in niche fields and is assisting individual clinicians to monitor their patients and provide accurate data for individual appraisal and revalidation. As the UK’s leading provider of electronic PROM’s software, Amplitude knows what it takes to implement, collect and manage PROM’s effectively. There are some key points to consider when embarking on a PROM’s initiative and these elements must be right to create effective clinical and patient engagement. A mixed group of people will be using your platform, each with varying degrees of clinical knowledge, technological skills and patience. So, it is vital that we make the whole process as simple as possible. An intuitive and user-friendly patient portal, that doesn’t intimidate the patient by using clinical terminology, is essential. Users should be effortlessly guided through an easy to use, step by step process of registering, consenting and completing the scores that are relevant to them. Remember that some of those using your platform may be uncomfortable, in pain or suffering from anxiety. Equally, they could be accessing to report on activity several years after the medical intervention has taken place. Consideration of your patient should come first when deciding on how, when and where patients will access your platform. At Amplitude we recommend that a login be sent to the patient so that they can complete the questionnaires in the comfort and privacy of their own homes at a pace suitable to their individual needs. However, the provision of iPads or kiosks in clinics can dramatically increase engagement levels as admin teams can ensure that items are complete before consultations and can be on hand to assist with any difficulties. Don’t be tempted to ask everything you need to know in the patients first interaction. Googling ‘the average adult attention span’ shows the shocking statistic that we only seem to be able to hold our attention for 8 seconds. Although the source of this commonly quoted statistic is actually quite vague, it’s easy to believe. We do a lot more in a lot less time, with distractions hitting us from every angle. So, keep this in mind when you’re deciding what to ask; do you really need 85 questions, or will 30 get you the core information that you need to be able to measure the outcomes effectively. The use of PROM’s benefits the patient, the clinician and future patients having the same treatment plans. The patient should be at the centre of any PROM’s initiative. The idea is to work with the patient to return them to a similar level of functionality that they experienced prior to the illness or injury. This makes the collection of baseline scores essential if you are to have a comparison in the future. It’s important to explain to a patient the reasons why you want them to complete PROM’s and as mentioned previously, adapt your explanation to ensure understanding, by whoever you’re talking to. Even more important is the need for the clinician to use the data that they are collecting. Using the data collected to help shape the patient’s treatment path, can help patients understand the worth of the system and the effort they are making in the process. If they see a real-time effect of completing their PROM’s, they will be motivated to continue. By creating high user engagement in early interactions, you can encourage higher levels of re-engagement with the patient in the future, when they may be fully recovered. Post treatment data collection is essential for assessing the long-term quality of the intervention and is important insight for analysing treatment plans on a larger scale. Amplitude Clinical Outcomes provide an industry recognised and NHS trusted PROM’s software solution that is reliable, easy to use, extremely secure and compliant. The system has been designed to make the collection of outcomes simple and part of the normal work routine, whilst also delivering clinically validated data that is useful and meaningful to all stakeholders. Follow this link to view case studies showing the system in action. 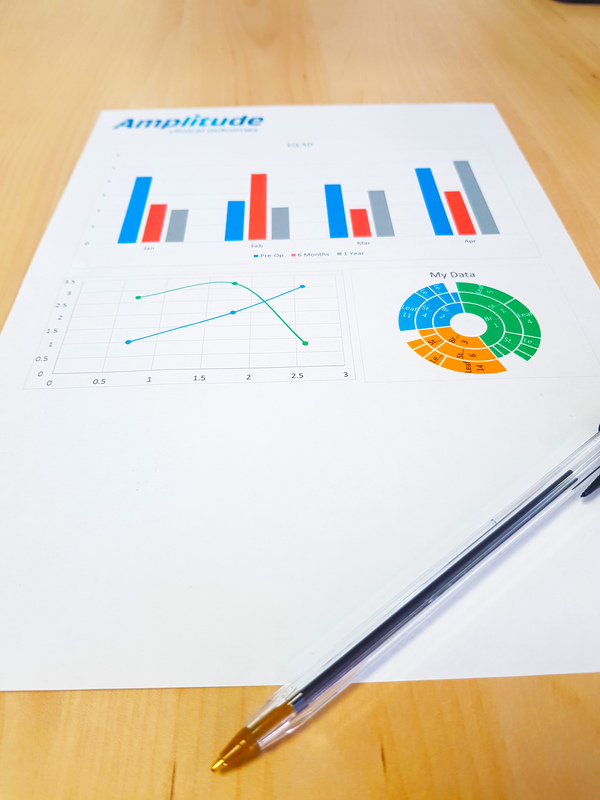 To learn more about Amplitude and its software for capturing outcomes data, please contact us at customer.support@amplitude-clinical.com or call 0333 014 6363.